Building collaboration between civil society and academia is the key to what Food Research Collaboration hopes to achieve; on April 28th, the FRC and the team organising the ESRC “Future of our Food” seminar series invited representatives of 27 Civil Society Organisations (CSO’s) working on food related issues in the UK to tell us their thoughts on the problems they care about and which they’d like to see investigated by academics. Each of the participants proposed three issues, and all the topics mentioned were then subjected to popular vote. The result was a lively debate that offered many possible starting points for research. How can the importance of nature and biodiversity in sustainable food systems be better understood? What model of technical support (agriculture, research, business)do small scale food producers need? What are the benefits of soil quality for resilience and biodiversity? What alternative indicators can be used to demonstrate success in sustainable farming? What messages on food are being presented to children and by whom? How can we get the public to value food more and make the behavioural shift needed to consume a sustainable diet? 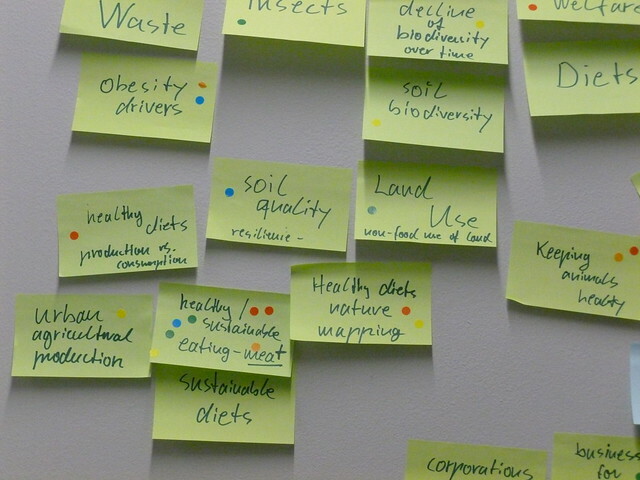 How can global financial structures and corporations fit into a sustainable food system? Where does the money go in the food system? What are the direct and indirect costs of food? What are the policy responses required to achieving a sustainable, equitable and healthy food system and what are the barriers to achieving this? 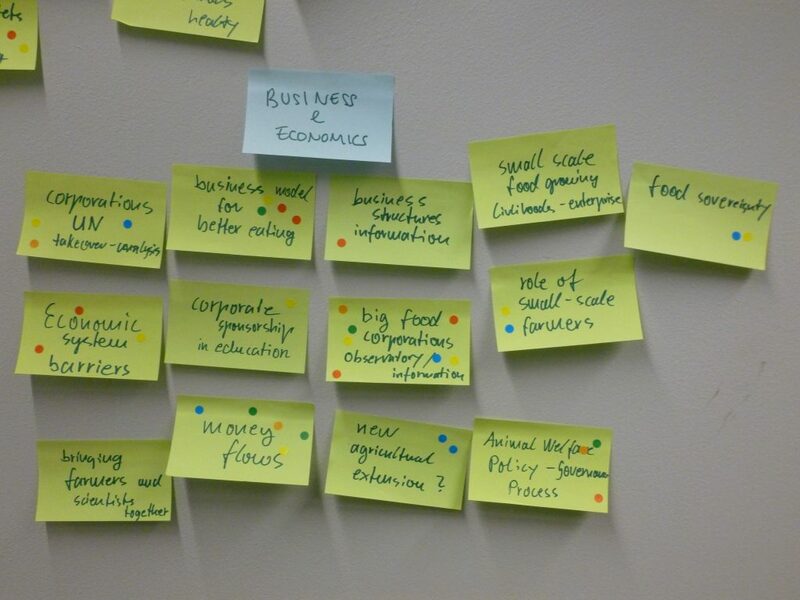 What could be the economic advantages of a sustainable food system? What are the drivers and indicators of an obesogenic environment (including the role of sugar and fat)? What are the main drivers behind the rise in food poverty and how can it be best addressed? How could jobs and wages be protected and promoted in a sustainable and equitable food system? What should be the balance between crop and animal production and consumption? How compatible is a food system that allows consumption of a healthy diet with one that is healthy for the environment? What are the indicators of a sustainable diet? Some of the most voted topics were the true cost of food, sugar taxes and sustainable consumption of meat; the participants were also very interested in food poverty, obesity drivers and the flow of money in the food system. The topics discussed have already been used for decision making on FRC research projects and ESRC seminar topics.